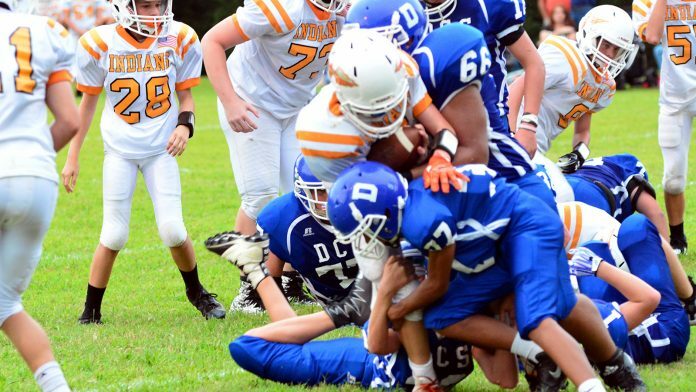 Dayton, TN — Dayton City School played their last of four straight opening football games at home and dropped game to Oneida, with a last minute touchdown providing the difference. Dayton City had trailed most of the game until a late touchdown, on a 95 yard fumbler recovery return, pulled the Sweat Bees even at 22-22 going into final minutes fo the game. With the loss, the DCS record goes to 2-2 and they now head out for four consecutive road games. Hayden Swafford kicked off for DCS and Meredith returned for Oneida. Indians took the opening kickoff back downfield for the opening touchdown of the game as Meredith scored the touchdown on a short run. Stephens scored the conversion for 8-0 lead with 4:47 left in the first quarter. DCS turned over the ball on their initial possession on an interception that was returned to the Sweat Bee 44 yard line. Meredith scored on short pass play for Oneida and Rex Pendergrass stopped the two point attempt to make the score 14-0 in the first quarter. DCS struck quickly on their second possession as Cayden Tipton smothered the onside kick at the Sweat Bee 49 yard line. Shortly after that Rex Pendergrass ran up the middle and after being bumped, he veered out to the right and streaked down the sidelines to score the initial DCS touchdown. Bryce Dupree scooted around the left end for the two point conversion to cut the Indian lead to 14-8. Oneida took the next kickoff and again drove the ball downfield for another touchdown. This one was a long drive that had three first downs and a couple of penalties. The drive began at end of first quarter and consumed most of the second quarter. In the end, it was the quarterback Anderson with the short touchdown run and Rector with extra point to push the lead up to 22-8. Sweat Bees took a short kickoff at midfield and were driving when buzzer sounder for half with DCS inside the Oneida 20 yard line. Dayton City took short kickoff around midfield and Pendergrass had nice run and Cole Smith was horse collared on his pass reception and penalty pushed the ball all the way down near the Oneida 20 yard line. Teams traded out turn-over-on-downs, but it was DCS winning the field position war as they took over possession at the Indian 20 yard line. Rex Pendergrass had nice run and then Bryce Dupree put on a nice juke to move on down to a first and ten for DCS inside the 15 yard line on the last play of the third quarter. Shortly thereafter, Dupree found Cayden Tipton for the short touchdown pass and Rex Pendergrass added the two point conversion on run over the right side to cut the Oneida lead to 22-16 with 6 minutes remaining in the game. Oneida took the kickoff back to 46 and proceeded to move the ball down field toward the DCS goal for a sealing touchdown. But as Oneida moved inside the ten yard line, Ethan Davis scooped up a fumble and rambled 95 yards the other way for the tying touchdown. Two point conversion was not successful and game stood 22-22. DCS tried onside kick but Oneida recovered with 2:31 left in the game. Meredith began the march with 14 yard run, and after a nice tackle for a loss by Pendergrass, Oneida came back with 20 yard run to the six yard line and scored on the next play for the lead. They tacked on two point conversion to take 30-22 lead with 30 seconds remaining in the game. DCS received ball and game ended with a Dupree to Davis pass that took the ball inside the twenty yard line as time expired. No time to rest as the Sweat Bees head up to Spring City as the renew the North vs South county rivalry that has been dormant for a few years. Spring City comes into the game 3-0. Before the game, Dayton City School took time to honor their eighth grade football, cheer and band members.